There are plenty of opportunities at the University of California, San Diego to be involved, make a difference, and find community. There are a lot of important skills that are built when involved such as communication, teamwork, and leadership. Below are the opportunities that are specific to the Department of Mechanical and Aerospace Engineering for graduate students. The MAE Graduate Student Council (GSC) is responsible for organizing social events, building a community within the department and serving as the voice for the MAE student body. Get involved with GSC to plan the next social gathering, let your voice be heard or simply attend events with your fellow colleagues. Recurring events include bi-weekly "MAE Tea Times" and quarterly BBQs. The Graduate Student Association (GSA) exists to advocate the rights and interests of our diverse community, to provide for the enjoyment of social, cultural, and service-oriented events, and for the betterment of academic and non-academic life of all graduate and professional students at UC San Diego. The MAE Department currently has 4 GSA representatives. More information about GSA on their Facebook! 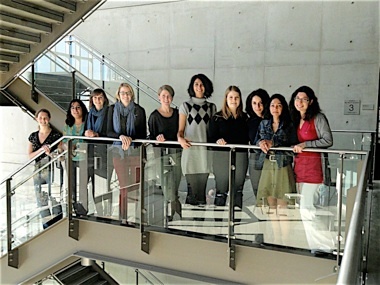 UCSD MAE Graduate Women was established circa 2012 in order to encourage a sense of community within graduate women in the Department of Mechanical and Aerospace Engineering at UCSD. Our activities include community meetings, professional development and corporate networking events, an undergraduate mentorship program, and the MAE Math Open House. Study, relax, play some ping-pong, have a snack, or/and hang out with other grad students in MAE's Grad Student Lounge! Located on the first floor of EBU II Room 103. Questions? Contact Joana Halnez, MAE PhD Academic Advisor, at jhalnez@eng.ucsd.edu.